As environmental campaigners regularly point out, Germany’s solar power generating capacity is 200 times that of the UK. They are streets ahead of us on renewable energy, even in areas like wind, where the UK is supposed to have an advantage. One of the main reasons for this has been the implementation of a successful ‘feed-in’ tariff on solar power. A feed-in tariff is a scheme that guarantees a pay-off for those who invest in solar power, and makes it worth the considerable initial outlay. Solar panels run continuously. When linked to the national grid they can put power into the grid when the panels are generating a surplus, like while the owner is at work for example. The power companies will pay for any energy the grid receives. What a feed-in tariff does is guarantee a price for that power. A fixed price makes the maths easy, and those who are considering solar power will be able to work out exactly how long it will take them to pay off the investment. The price is usually above the market rate, essentially subsidizing solar power. Germany introduced the feed-in tariff in 1999, and then adjusted it in 2004. It is funded through a small charge on electricity bills, adding around a euro a month to a household bill. Because it guarantees a price for 20 years, starting at four times the market rate, solar power is now profitable. Thousands of households have taken up the offer, and can expect returns of around 8-9% on the installation cost. Germany now gets 12% of its power from renewables. As more people decide to fit solar panels, the competition to supply them lowers the price. 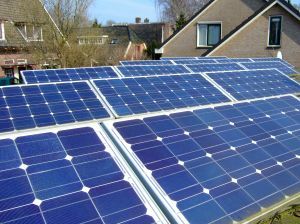 It costs £17,000 to fit your house with solar power in the UK, and £10,000 in Germany. The incentive from government supports the industry and helps to achieve economies of scale that will bring down prices, as well as encouraging further innovation. We haven’t got a feed-in tariff in the UK yet. The government has proposed one, and it’s under discussion. We really ought to have one, given its proven record in kick-starting solar, and it needs to be generous enough to work. To help convince the government to do something sufficiently bold, an alliance of charities and businesses (including our favourite solar charity SolarAid) has launched We Support Solar. If you think a feed-in tariff is a good idea, click over and sign the petition. Thanks for your post, it is always nice to read posts from other people who care.